Did you hear about Eagle Scout John Rosher? 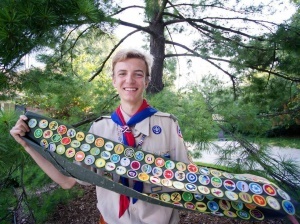 He recently earned all 136 currently available merit badges. John's adventures, from scuba diving to climbing Mount Kilamanjaro, recently put John into the local spotlight. This event is a chance for Kansas City area Eagle Scouts to meet other Eagle Scouts, build their Scouting network, and enjoy a fun event in an informal setting. All Kansas City area Eagle Scouts and their families are welcome to attend. No reservation is required, and you are only expected to pay for what you want to do at Pinstripes. Dress is casual - no scout uniforms needed. If you have any questions, please email Phil Raine at phillip.raine@gmail.com. We hope to see you there — and bring an Eagle Scout friend, as well! NESA offers academic and merit based scholarships for Eagle Scouts. These scholarships range from $2,000 to $50,000. If you or an Eagle Scout you know is attending college and could use extra scholarships to help with college costs, make sure to submit your application before the October 31, 2015 deadline. Applications and more information are available on the NESA website. Is your NESA membership current? Eagle Scouts from around the nation filled the Munn Ice Arena on the campus of Michigan State University for one of the largest gatherings of Eagles ever. Eagle Scouts in attendance heard from NESA President Glenn Adams, astronaut Col. Mike Fossum, and past BSA President Rex Tillerson. In addition, Todd Plotner, a Chicago area Eagle Scout was recognized with the Distinguished Eagle Scout Award. This event highlights what every Eagle Scout already knows: Eagle Scouts are some of the most outstanding members of society today and are as necessary as ever. While it is important to be a member of the Kansas City Eagle Alumni Association, consider joining NESA as well. NESA provides connections to these distinguished Eagles, supports Eagle Scouts through scholarships and grants, and furthers the aims of Scouting. Check out NESA at www.nesa.org.